Mathias Alan has been working his makeup magic for more than 12 years on a variety of famous faces and celebrity icons. His creativity and talent effortlessly shines through his work which can be seen at red carpet events, commercials and music videos. For the past few years, Mathias has been the key makeup/hair artist on E! Television's ‘The Soup’ with Joel McHale. In addition, he is also one of the lead makeup artists on E! Television's hit show ‘Fashion Police’ with Joan Rivers, George Kotsiopoulos, Giuliana Rancic and Kelly Osbourne. Sigma Beauty: With all of the beauty products out there on the market, what are the most important staples you think every artist should have in their kit? Mathias: No. 1 is fantastic brushes! Out of all the items in my kit, brushes are by far the first thing that I can’t have a successful makeup application without. In a pinch, I can turn lipstick into cream blush, a concealer into a full foundation, a bronzer into an eye shadow or contour color, and black liquid eyeliner into a mascara… however if I don’t have my brush collection with me on set, I can’t do ANYTHING of any remarkable beauty. Second is great skincare. I carry a small facial studio in my kit because I never know what a model or celebrity’s skin is going to be like the first time I work with them. Sometimes I have to exfoliate first, other times I have to add an abundance of oil based serums and creams just to get a dehydrated complexion to look radiant. Last but not least is good lighting. I own the GLAMCOR portable lighting station and it is necessary approximately 75% of the time! When I’m working in a television or photography studio, the makeup/hair station is normally set up with great lighting but often times I am booked at a private home or hotel room and asked to set up in a dimly lit room or a room without a great window for natural light. Doing a full makeup in the dark is NEVER going to turn out fabulous! Sigma Beauty: What would you say is the go-to makeup look for the fall season? Mathias: No matter what look you create stay on trend for each season, your skin is your main feature and never goes out of style. Satin complexions are what I try to achieve on all my clients. Silicone-based foundations and hi-def powders with a silica base work best. Stay away from tinted moisturizers, gel or mousse based foundations, and pressed or loose powder with a lot of talc - these will not help you to achieve what I call the “Rose Petal Finish” which once I am done, makes your skin feel smooth and silky like a rose petal. Sigma Beauty: What are your three favorite Sigma products and why? Mathias: 1) - F86 Tapered Kabuki brush. the handle is large so it fits in my hand well with a sturdy weight. I also love the amount of bristles in the barrel because they pick up foundation lightly at the tip but deposit with a buffing effect more towards the base. 2) - F25 Tapered Face brush. the softness of these bristles and pointed tip make applying loose powder a dream! I absolutely love everything about how this brush is shaped for everything from blending contours in the hollows of the cheeks, to highlighting the collar bones with frosted loose color effects. 3) - E30 Pencil brush. A major factor in what makes my technique unique is the specific details I choose to focus on in an eye or face shaping work. I use this brush for so many little details and I can’t do a makeup without it. I can define a crease on an eyelid, smudge out a pencil in a lashline, contour the sides or tip of a nose, apply lipgloss, or even paint hair into a hairline that needs to be filled in! All the little special effects that I have incorporated into my craft with one amazing tiny little must-have brush! Sigma Beauty: What is the best piece of beauty advice you think everybody should follow? Mathias: Drink lots of water, cut down on caffeine, exercise regularly, and find a fantastic facialist that you can go to for microdermabrasion about once a month! Mathias: Fashion and beauty magazines have always captured my attention since I was in high school and I started becoming interested in theater and art. Photography is a huge inspiration to me, from the supermodels of the 90s to celebrities on the cover of all the major fashion magazines at your newsstands today. I have always been inspired by the work of a great photographer and their muse- which is why I am so honored to be the Beauty Editor of an incredible digital platform magazine called BELLO mag. I am working monthly on creating new and innovative beauty editorials for the beauty section, as well as keying the makeup and hair teams for all of our celebrity fashion editorials and pictorials. this is wonderful!! i follow him on instagram and its great to learn more about him!! He has some helpful tricks up his sleeves! 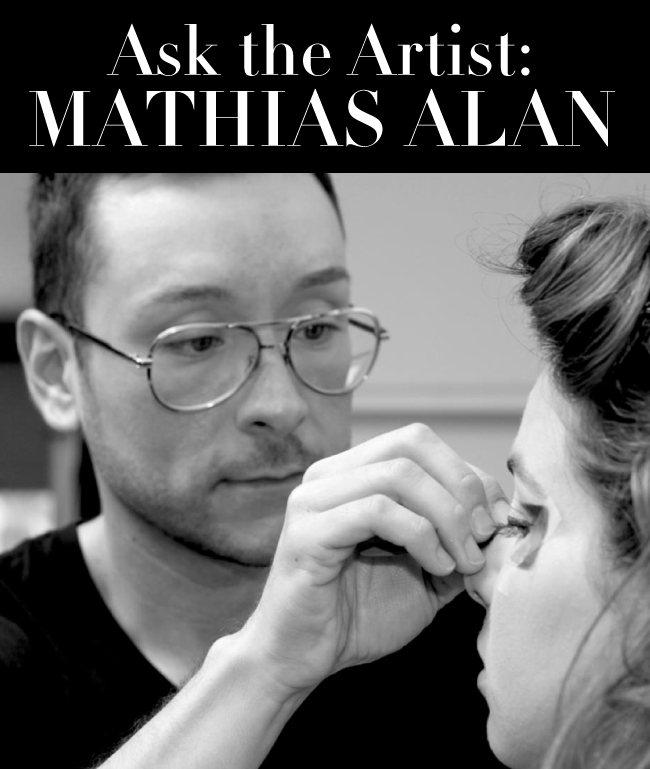 Mathias is one of my favorite celebrity makeup artists to follow. Great feature! Thanks for reading :) We will take a peek at your blog as well!